The latest reviewed version was checked on 17 February 2018. There are template/file changes awaiting review. The following maps show 8 selected areas of sky suitable for 8x40 or 10x50 binoculars. Below each map there is a short description of the selected galactic area and of some objects visible there. On the maps the Celestial South is up and the Celestial North is down, so the stars and the objects are mapped as they appear from 30°S. The only exception is for the Carina Arc map, whose southern declination is higher than the latitude of the point of view. The Alpha Persei Cluster, also known as Melotte 20, is a bright stellar association in Perseus constellation. To the naked eye, the cluster consists of several blue stars of spectral type B, along with the most massive member, the yellow supergiant Alpha Persei itself. Brightest members include Alpha, Delta, Epsilon, Psi, 29, 30, 34 and 48 Persei. Through binoculars, dozens of blue-white stars are clearly visible. 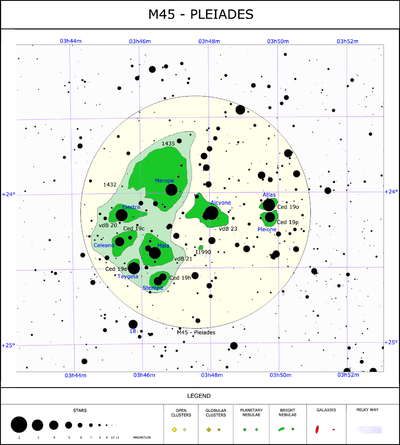 The Alpha Persei Cluster is the core of a OB association, known as Perseus OB3; its distance has accurately measured by Hipparcos satellite, as 184 parsecs (601 light-years). The age of the cluster is 50 million years and originated after an intense star formation process; this same process originated also many other OB associations. The most massive stars exploded as supernovae within few millions years, generating powerful shock waves that pushed away any gaseous remnant of the giant molecular cloud in which star formation took place. Part of this gas forms today the so-called Lindblad Ring, a giant structure in which other OB associations were formed, such as all the blue stars of Crux, Centaurus and Lupus (the Scorpius-Centaurus Association) and Cepheus OB2, in Cepheus constellation. The Pleiades cluster, also known as the Seven Sisters of Messier 45, is the brightest open cluster in the sky. It lies in Taurus constellation and is dominated by hot blue and extremely luminous stars that have formed within the last 100 million years. The nine brightest stars of the Pleiades are named for the Seven Sisters of Greek mythology and are all visible to naked eye in a dark and clear night. 8x30 and 10x50 binoculars may show dozens of blue-white components, arranged in some concatenations. The cluster contains over 1,000 statistically confirmed members, although this figure excludes unresolved binary stars. Its distance is currently thought to be the value of about 135 parsecs (roughly 440 light-years); at this distance, the cluster core radius is about 8 light-years and tidal radius is about 43 light-years. Under ideal observing conditions, some hint of nebulosity may be seen around the cluster, and this shows up in long-exposure photographs. It is a reflection nebula, caused by dust reflecting the blue light of the hot, young stars. It was formerly thought that the dust was left over from the formation of the cluster, but at the age of about 100 million years generally accepted for the cluster, almost all the dust originally present would have been dispersed by radiation pressure. Instead, it seems that the cluster is simply passing through a particularly dusty region of the interstellar medium. The Hyades cluster (Mel 25) in Taurus constellation is the nearest open cluster to the Solar System, at the distance of only 41 parsecs (151 light-years), and one of the best-studied of all star clusters. It consists of a roughly spherical group of 300 to 400 stars that share the same age, place of origin, chemical content, and motion through space. Many of its members are clearly visible also to naked eye, and form a sort of “V” along with the bright red giant Aldebaran, that appears to dominate this cluster; however, Aldebaran is completely unrelated to the Hyades cluster, as it is located much closer to the Solar System, at one third of the distance of the Hyades. The components of the Hyades have an average age of 625 million years; some of the most massive components are evolved as red giants, such as γ, δ1, ε e θ2 Tauri. The age, the metallicity, and proper motion of the cluster coincide with those of the larger and more distant Praesepe Cluster in Cancer constellation, and the trajectories of both clusters can be traced back to the same region of space, indicating a common origin. The most massive stars are concentrated near the core of the cluster, a common phenomenon in old open clusters known as mass segregation. Orion Belt and Orion Sword are two of the best known asterisms in the sky. Both are clearly visible to naked eye also from medium cities; furthermore, their position close to the celestial equator allows them to be seen all around the world. The Orion Belt is composed by three blue, luminous stars: Alnitak, Alnilam and Mintaka; these stars are probably not physically bounded each other, and lie at the distance of respectively 820, 1340 and 915 light-years. Close to Alnitak there is the Flame Nebula (NGC 2024), an H II region ionized by the light of a star embedded in its nebulosity; Alnitak and the nebula are not physically bounded, because the Flame Nebula lies at 1500 light-years from us. Half degree south of Alnitak, a dark cloud hides partially the light of the nebula IC 434, becoming itself visible; its proper name, Horsehead Nebula, derives from its shape. The Orion Sword is a group of young stars at 1500-1600 light-years from the Solar System; the centre of this asterism is the great Orion Nebula (M42), one of the brightest and best famous nebulae in the sky. The Orion Nebula is an H II region containing a very young open cluster, known as the Trapezium due to the asterism of its primary four stars. Two of these can be resolved into their component binary systems on nights with good seeing, giving a total of six stars. The stars of the Trapezium, along with many other stars, are still in their early years. The Trapezium may be a component of the much-larger Orion Nebula Cluster, an association of about 2,000 stars within a diameter of 20 light years. Two bright open clusters are visible to the north and to the south of the nebula, NGC 1981 and NGC 1980 respectively. The constellation of Carina harbours one of the richest areas of the Milky Way; along this direction we can see many unobscured objects belonging to two spiral arms of our Galaxy, the Orion Spur and the Carina Arm. A binocular is enough to see many rich star fields, clusters, and nebulae. The most prominent object belonging to the Orion Spur here is the IC 2602 cluster, nicknamed Southern Pleiades because of its luminosity; the brightest star of this cluster is Theta Carinae, followed by five-six stars visible also to naked eye. IC 2602 has 150 components, most of which are blue-white; the cluster is 30 millions years old and lies at the distance of 147 parsecs (479 light-years). Probably it belongs to the Scorpius-Centaurus OB Association. Another rich open cluster is NGC 3532, the Wishing Well cluster; it has almost 600-700 stars and lies at the distance of 1300 light-years. The great Carina Nebula (or Eta Carinae Nebula) is the most prominent object in the Sagittarius Arm; this is the brightest nebula of the sky, brighter than Orion Nebula. It is a giant H II region that harbours a brilliant OB association (Carina OB1), as well as the luminous blue variable Eta Carinae, one of the most massive stars known in our Galaxy. Long photograph expositions can show many gaseous filaments to the east of the nebula. Many open clusters surrounds this nebula, included NGC 3293 and NGC 3324. Another important nebula here is IC 2944, visible in Centaurus constellation. The core of Coma Berenices constellation is an extended group of stars widespread on an area of five square degrees; these stars form a small but nearby open cluster, known as Mel 111, that lies at 88 parsecs (288 light-years) from the Solar System. Almost all of the 40 components are visible to naked eye under a dark and clear sky; a small binocular is the best instrument to have the best view of this cluster. The age of the cluster is 450 million years and some of its components are yellow-orange stars. The shape of Mel 111 gave to the ancient astronomers the idea of a tale (the tale of the Leo constellation); Ptolemy III, in around 240 BC, separated this group of stars from Leo and renamed it for the Egyptian queen Berenice's sacrifice of her hair in a legend. Using a small telescope, some galaxies become visible in the area of this cluster; most of them are spiral galaxies, such as NGC 4559 and NGC 4565, the Needle Galaxy. Many bright objects are visible in the northern part of Sagittarius constellation, near the galactic centre. Looking with binoculars, rich star fields are revealed, as well as two bright nebulae, Lagoon Nebula and Trifid Nebula. Both are located in Sagittarius Arm and are site of star formation. The Lagoon Nebula lies at 4100 light-years, in the nearest edge of the arm; the Trifid Nebula is located a bit farther away, at 5200 light-years. Sagittarius has the highest number of objects detected by Charles Messier; many of them are globular clusters, such as M22, one of the most brilliant globulars in the sky; its position is easy to find, because it lies two degrees north-east of Lambda Sagittarii, and a small binocular is enough to see it as a small bright nebulous patch. M23 and M25 are the open clusters located between Orion Spur and Sagittarius Arm; both are partially resolved into stars looking with 8x40 or 10x50 binoculars. The bright patch of M24, known also as the Sagittarius Star Cloud, is not a true cluster, but a rich and extended star field, belonging to the Sagittarius Arm. Near the edge with Serpens constellation there is the Omega Nebula (M17), which is part of a great star forming region along with the near Eagle Nebula (M16) and Sh2-54. In the constellation of Cygnus we can see the Orion Spur along its median line. Many galactic structures are visible here, such as extended H II regions and clusters of stars. The Milky Way in this direction is partially obscured by a long system of dark clouds, that spans from Deneb to Aquila constellation; these clouds are globally known as Cygnus Rift and are clearly visible at naked eye under a clear sky. Rich star fields are visible with binoculars in this area of sky. The most famous object in Cygnus is probably the North America Nebula, a great H II region at 600 parsecs (1960 light years) from the Solar System; this nebula, along with the smaller Pelican Nebula, is part of the giant clouds of the Rift, illuminated here by an embedded and hidden blue star. The two nebulae are separated by a dark cloud in which is active the star formation. The region around Sadr (Gamma Cygni) is rich of giant molecular clouds as well. Part of this gaseous mass is ionized and illuminated by young luminous stars, such as the components of the Cygnus OB2 association, at 1700 parsecs (5500 light-years). The nebula IC 1318 belongs to this region, along with many others. The giant molecular cloud named Cygnus X, extended in the direction of Sadr, is one of the most massive clouds known in the Milky Way Galaxy. To this region seems to belong also M29, a small young open cluster clearly visible through binoculars.